67 Blankets for Nelson Mandela Day is all about breaking records and this year is no exception. KnitWits are in the throes of attempting another world record by crocheting 27 kilometres of scarves or 27KmScarf as it has become known as. The record will take place at the impressive Nelson Mandela Capture Site in Howick, KwaZulu-Natal, on July 29, 2018. However, the extended deadline for anyone to finish the scarves they are currently crocheting is July 6, 2018. 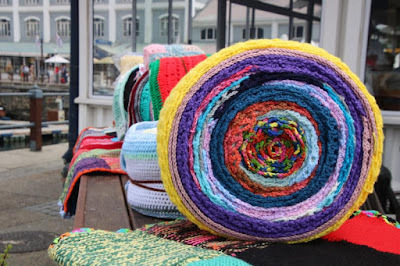 “27 kilometres is an extremely long scarf and we need as many hands on deck as possible,” says Carolyn Steyn, founder of 67 Blankets, an initiative linked to Nelson Mandela Day which aims to keep disadvantaged people warm in winter. Since the supernaturally-long scarf is an attempt at breaking the Guinness World Record, there are rules which come with the well-known brand. Each scarf must be 20cm x 150 to 200cm. It also needs to be crocheted rather than knitted and the hook size must be no bigger than 6.5mm. “KnitWits who have already knitted scarves that don’t fit the Guinness World Book criteria need not worry. It has not been in vain. These scarves will be used for our yearly SSS (Secret Scarves SShhh),” Steyn says. The 27kmScarf event on July 29 kicks off at 10h00 at the Nelson Mandela Capture Site on the R103 (Howick / Tweedie off-ramp off the N3) Please bring your own picnic. There will be food at the Truth Café and some great local entertainment.